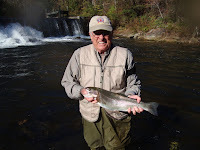 The Liars Club: Best Georgia Trout Fishing Now! 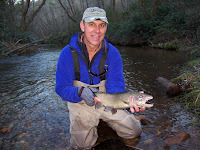 There isn't a trout angler in Georgia who isn't at least a little frustrated over the high water conditions found on most of our year round streams thi s past fall and even now as we approach 2010. Since we made a covenant pact to never complain about the rain ever again after the past several years of drought, we'll just tell you where the best fishing still can be found and, looking at the weather forecast, may remain so for the next week or so. First, we want to unabashedly tell you that our private waters at Nacoochee Bend and Mountaintown Cree k are as hot as a firecracker at the moment. We're not only catching fish, we're catching some big fish at these venues. Now, don't ask us how they survived the past two summers, but Nacoochee Bend has given up some huge rainbows in the 2 foot range recently. Another interesting twist at Nacoochee Bend can be found in the mill pond just upstream of the Nora Mill dam. In this slack water, which is too deep to wade, there are some big, dumb fish. It's perfect for pulling big streamers through but only if you can make long roll casts from the bank with big flies. The reward is big fish. If you're comfortable with this kind of fishing, you should give it a try. And, since we've had such positive repsonse to our $90.00 half day, $140.00 full day Nacoochee Bend offerings, we've decided to continue it for a little longer. Remember, you don't have to purchase a trip and take it right away. If you purchase one of these gift certificates, you may make the trip any time you like. Now, on to the public waters which are fishing well. Let's see, the Chattooga is too high, the Toccoa DH is too high, the Toccoa tailwater is pumping like crazy and the Chattahoochee below Buford Dam is unfishable most of the time lately. So where are the best streams? Smith Creek DH and Dukes Creek at Smithgall Woods. For Smith Creek, yes, it's been getting a good bit of pressure over the holidays but no one is complaining about the quality of the fishing and the size of the fish. Smith Creek is more fun to fish right now than it has been since it was first designated a Delayed Harvest stream. There are plenty of fish, both rainbows and browns, in the 12" to 16" range. Put plenty of split shot on and dredge the pools and runs for a day of fun. Don't forget to check with us to see which flies are working up there. This past weekend it was flame red San Juan worms, Rainbow Prince, Purple Streak Flies and orange soft hackles. Dukes Creek has also been fishing well this past week. The favorite rigs have been something big like a #8 Whitlock's Helgrammite with a soft hackle or a black Zebra Midge dropper. Remember, the water may be up on Dukes but it's also very clear so you'll have to be looking for fish as you approach the pools. Again, as at Smith and Nacoochee Bend, get your fly down in front of the fish. In this cold weather, the trout won't be likely to move very far to look at your fly. Hit them on the nose for the best shot at success. A couple of other suggestions for a half or full day of fishing. The public section of the Soque River. This time of year, you won't find many bait fishermen there but you will find some real hogs in there. Some of our guides have recently landed browns in the 20" plus range up there. Easy access, no check-in, big fish. And finally we want to recommend the upper Tallulah River near Tate City. There are miles of water here and not many anglers this time of year. Some of the most fun winter fishing we've had has been on this small river in the winter. We're not sure if it's the fishing or just the environment that attracts us to the Tallulah. This isn't the same stream that is wall to wall campers and worm fishermen during the summer. It's plunge pool after plunge pool of crystal clear water where you can spot a nine inch trout finning at the bottom of a twelve foot deep hole. Bring your long leaders, your split shot and your polarized glasses and give it a try.